What is a cavity? A cavity is actually decaying that occurs within a tooth’s structure. It begins in the outer enamel. When it is left to worsen, severe damage may occur. In this instance, a root canal may be necessary, or the entire tooth may need to be pulled. Tooth decay happens for a number of reasons. Teeth are covered in bacteria. As a person eats or drinks, this bacteria creates acid that may harm enamel. Also, when a person does not follow a consistent oral hygiene routine, plaque begins to collect on the gum line and chewing surfaces. Over time, this eats away at teeth, and cavities develop. The American Dental Association explains that early decay may be undetectable. However, advanced cavities may bring various symptoms. The best way to prevent tooth decay is by brushing and flossing on a regular basis, especially with a toothpaste that contains fluoride. After each meal, it is wise to drink water that helps to rinse away trapped food particles. Also, water that contains fluoride will strengthen enamel. It is wise to avoid sugary snacks and drinks as well. 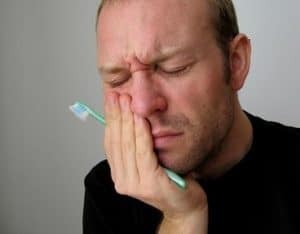 When tooth decay advances, it can be painful and dangerous. Bacteria may travel throughout the tooth and cause a severe infection beneath the gums. This can spread to other parts of the body. If it enters the bloodstream, it could be fatal. If you suspect that you have a cavity or want more information that explains how to prevent tooth decay, call our office today! Dr. Walters will answer all of your questions, examine your mouth, and treat any problems that are detected. What You Need to Know About Dental ImplantsHow Can You Prevent Cavities & Tooth Decay?